The materials were custom made and expertly CNC routered by the Allplastics team. Virtually every blade was bespoke. 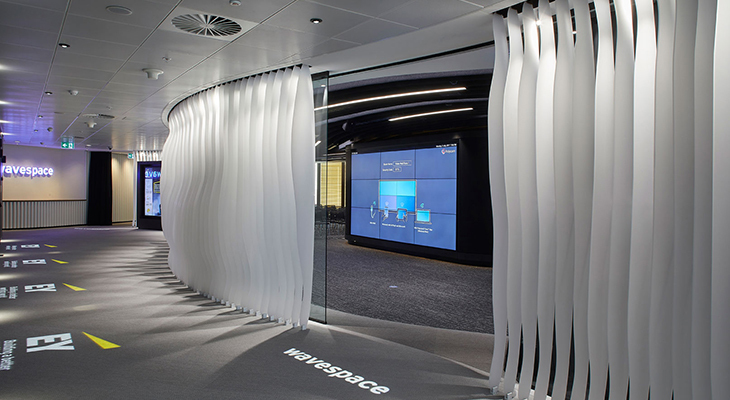 A series of 10mm thick blades with a cleverly designed curved shapes come together to form a floor to ceiling “wave” to subtly segregate two areas of the EY wavespace at 200 George Street in Sydney. The project was expertly managed by the Shape Group and professionally installed by MOJ. Justin Abagi of the Shape group said “We thank the Allplastics team for their cooperation in achieving a wonderful outcome for our client”. He added “time constraints and unconventional designs were professionally handled by their production team”. Shape Group has been involved in major commercial projects over 20 years. Vic Kalloghlian, the managing director of Allplastics concluded “we love our work and thrive on converting our clients visions and exceptional designs into sophisticated interiors and practical outcomes”.